diy | Live Life. Create Dreams. 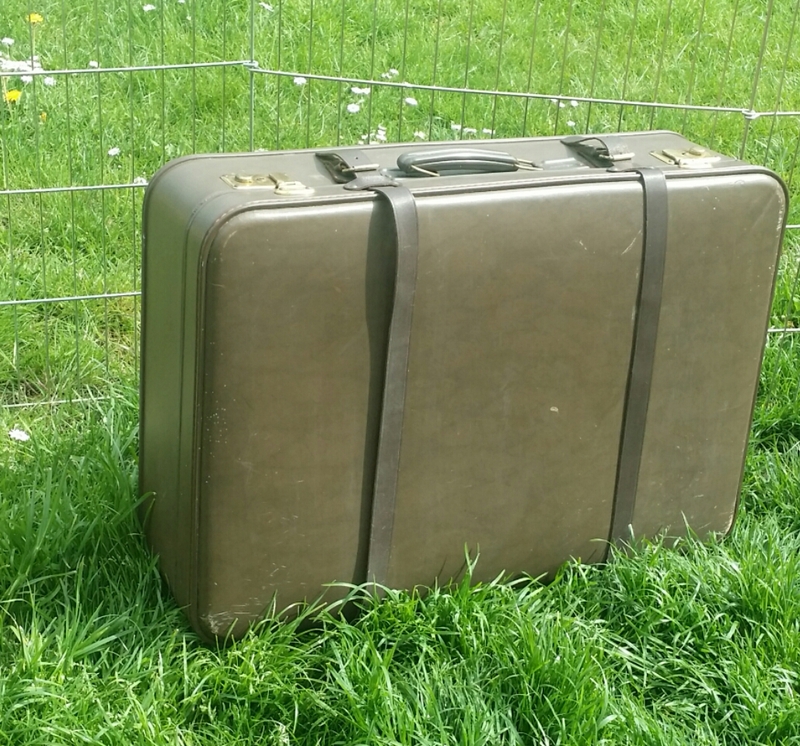 It’s Time For Another Vintage Suitcase Project! 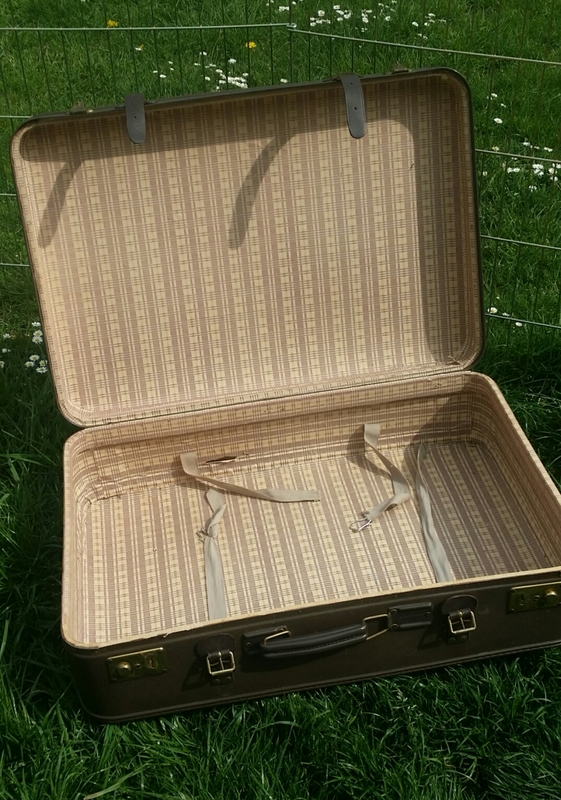 A few days ago a friend and I were at a local thrift shop when she spotted a vintage suitcase for me. I took one look and fell in love. It’s not intricate or beautiful in the same way that my last one was, but it is unique. It looks like it may be from the late 40s to the mid-50s. It is most likely of German origin. I purchased it, not having any clue as to what I was going to do with it. Yesterday, as I was contemplating what to do with my “new” suitcase, I remembered a post I recently saw on Leah’s Confession Closet. She posted a picture of her Ikea Vanity table, which lit my creative imagination. 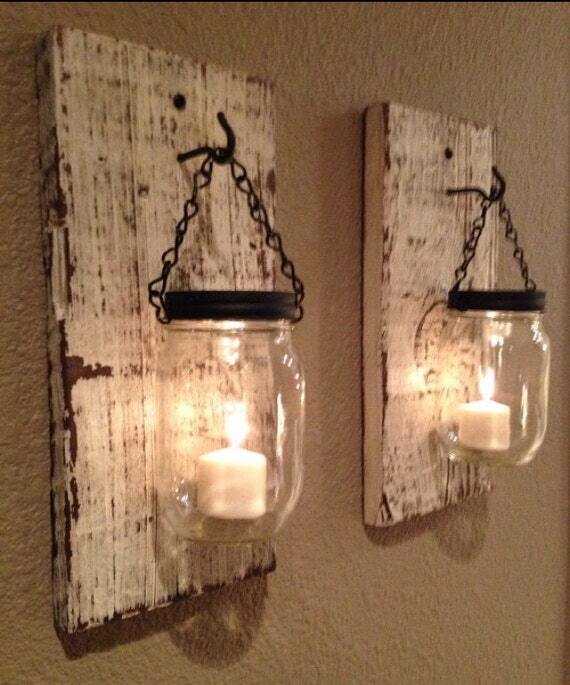 Then I did what any normal Diyer does–I went to Pinterest. It’s not that I need a tutorial or further inspiration, but I do love to look at what others have done so that I can improve upon my own ideas. I also wanted to see what kind of legs would look best. Here are a few of the Vintage Suitcase Vanity Tables that I came across on Pinterest. The first two are from Mrs. Hyde’s on Etsy. Click on the pictures to visit her shop. I just love the long tapered legs on this vanity table. 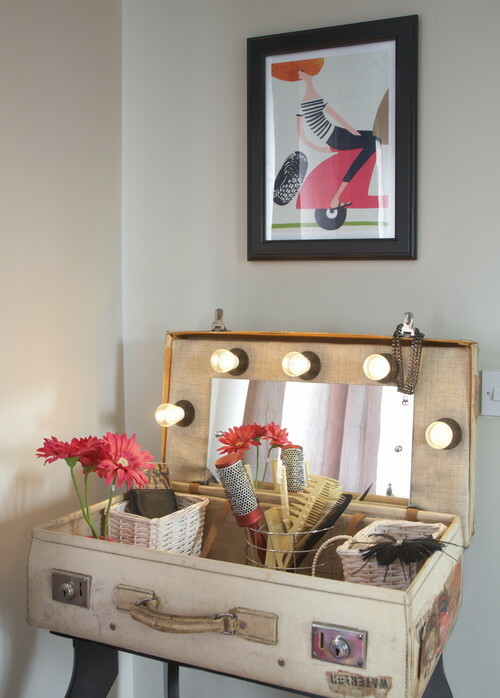 I love the idea of turning a smaller suitcase into a table top or dresser top vanity. Her work on this one is beyond me. I love the fabric that she chose. This one is from Optimize Design. I found the picture on Houzz. I love the vanity lights, but I don’t think that they will look right when the vanity is closed. I really can’t wait to get started on this project. I will have to contemplate the leg style. I would love to use hairpin legs, but they are quite expensive. I do think it would look good with angled tapered legs though. In the mean time, I have to finish the other projects that I already started. I don’t say this often, but he was right. So, instead of heading out to Ikea on Monday, husband found a great solution–pallets! They are free at the Post Exchange (PX). So he went and grabbed about 5 or 6 of them. After we put the bed together and measured the area, he went outside and cut them. They work great! My mistake saved us 20 Euro! More on the pallet bed slats later. I checked Pinterest of course! Here are a few ideas that I found. Just click on the Picture to go to the web page. This would look nice in my daughter’s room. 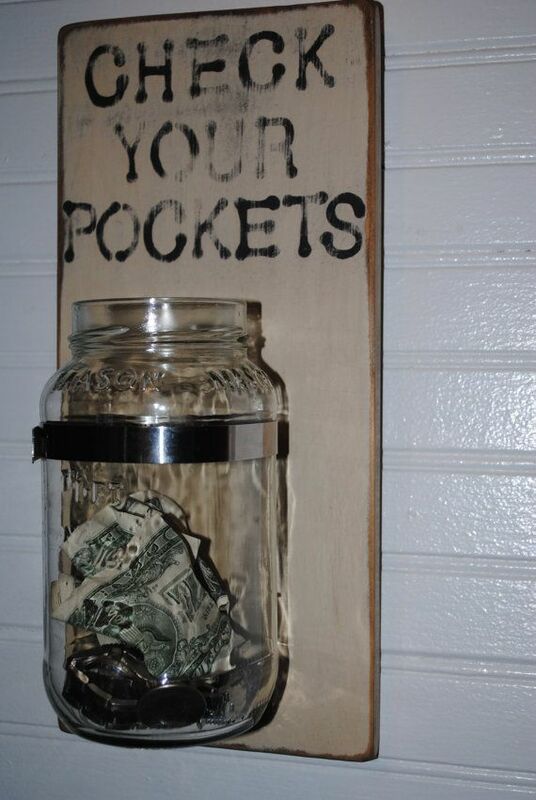 I like this idea for the Laundry room. Could do a couple of these with each family member’s name. I love this one too. We drink more beer now that we are Germany, so this one makes a lot of sense. These could make a nice gift. I also love these. They would look great on the patio. These are just a few of the thousands of ideas on Pinterest. Of course, I’m working with bits and pieces, so I’m doing small projects. I can’t wait to get started on one of these ideas. Or maybe I’ll come up with an idea of my own. 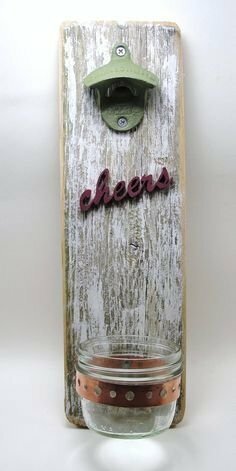 Have you made any pallet projects that you would like to share? Post a link in the comments! Saturday was a very busy day for my daughter and me. We went to the Nurnberg/Furth Ikea to pick up the majority of the items on my Ikea Project Mood boards. From the Living Room Mood board, I purchased two Ektorp love seats, the Hemnes TV Console, 2 narrow Billy Bookcases (and doors), and the Hemnes side table. The design has changed a little from this original mood board. and I can’t wait to show you the finished room! For the office I picked up the two Billy Bookcases, a new cover for the Beddinge Lovas Futon, and the remaining part of my desk. We also picked up some legs for a dining room table and bunch of small miscellaneous items that we either needed or wanted. We also picked up dinner in the Ikea grocery section–meatballs, mashed potatoes, gravy mix, and lingonberry sauce. Loaded by me and my daughter. When we got home, my husband and I assembled the Ektorp love seats. After he went to bed, my daughter and I assembled the Hemnes TV console–not easy! Sunday I worked on the bookcases and the room arrangement. It’s not perfect, but we have an odd and small space, so we made it work as best we could. THis next picture is all of the parts for the Hemnes TV console. My daughter came up with the idea, and it made the assembly SO much easier! Maggie certainly likes the sofa. We need to re-train her. This is what we’ve done so far…just a sneak peek. It’s spring and that means that it is time to plant our vegetable garden. Last year we were partially successful at growing our veggies in pots. The salad garden was amazing! However, we started the garden a tad too soon and lost half of our tomato plants and all of the bell pepper plants. Aside from the early planting failure, we also learned that ceramic pots burst when you leave them out over the winter months. Here are my Herb pots that burst. This is how the patio looks today. I think that something like this will looks a lot better than those cheap window box planters that bulge out in the center. Though I don’t really need anything this large, I think the depth will work well for the tomatoes and bell peppers. Perhaps adding some sort of lattice to the back would work for growing cucumbers and fall squash. When a patio is as small as ours, using vertical space is important. This year I want to try growing our herbs in something like this. As for the fence…our ghetto fabulous fence needs to go. We had some high winds earlier this spring and the fence kept blowing over. I’m looking at Pallet fence ideas. I really love this one. The post at The Nest by Raul Avenir has DIY instructions–wich is hard to find. This one is very practical and beautiful, but does not include instructions. I’ve seen this image several times, but I just can’t seem to find the original source. But the page does have several pallet use ideas. Here are a couple of ideas that I quickly sketched out.